Sitting on the balcony of El Midi Bistro, my husband and I watched as the clouds turned shades of purple and pink and the sun dipped behind the city’s red rooftops. This quaint restaurant, located in downtown Guanajuato, specializes in French cuisine and is one of our favorite places to go for date night in our new home. 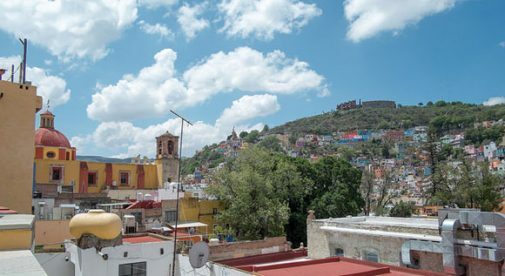 This week, we are celebrating six months in Guanajuato, the hilly capital of Mexico‘s colonial highlands. When we first came to Mexico, we lived with our two sons in the resort town of San Carlos on the Sea of Cortez. But then we realized that we needed more than sunshine and beaches in a place to live. We wanted a walkable city with shopping, food, art, culture, and music. From the day we arrived, we were smitten by the energy of Guanajuato. The city feels like a slice of Europe. There are few roads and traffic. You can walk everywhere and enjoy the buzzing plazas full of trendy sidewalk cafés, delicious street food, and musicians on every corner. And the city’s brightly painted buildings add a little magic to everyday life here. A typical day for us starts out at Plaza San Fernando, in the historic center of Guanajuato, having breakfast at an outdoor cafe. My favorite local breakfast is the carne asada—complete with guacamole, rice, and bread. It’s cooked to perfection and is less than $5. I also love the huevos rancheros that is covered in the best chili —not too hot and yet full of flavor—which is less than $3. Most days, we stay here and sip tea and coffee until about noon. Most U.S. citizens we meet don’t understand how we can afford to enjoy lazy mornings like this one. It’s simple—we each work about three to four hours a day, online. We increase our spending power by earning in dollars and spending in pesos. My husband is an artist who primarily paints on the iPad. His art is printed as limited editions on metal, is sold online, and can be shipped anywhere in the world. I’m a business consultant. I help female entrepreneurs make money in their own business so they can decide how they want to spend most of their time—be it traveling or being with their families, or both. In Mexico we don’t live to work, we work to live. We eat delicious homemade food together. We go for walks up and down the hills and through the many vibrant plazas in town. We play. And every six months we go visit another country. In October we went to Costa Rica and we are now planning our April trip. Having a low cost of living makes all this possible. We live on approximately half of what we did in Arizona and we have many more luxuries in our life now. I get regular massages, spa treatments, and great shopping at a fraction of the cost. It feels like home here. The slow pace and high quality of life are what we always dreamed of when we started working for ourselves. It’s something different and that’s why we love it.